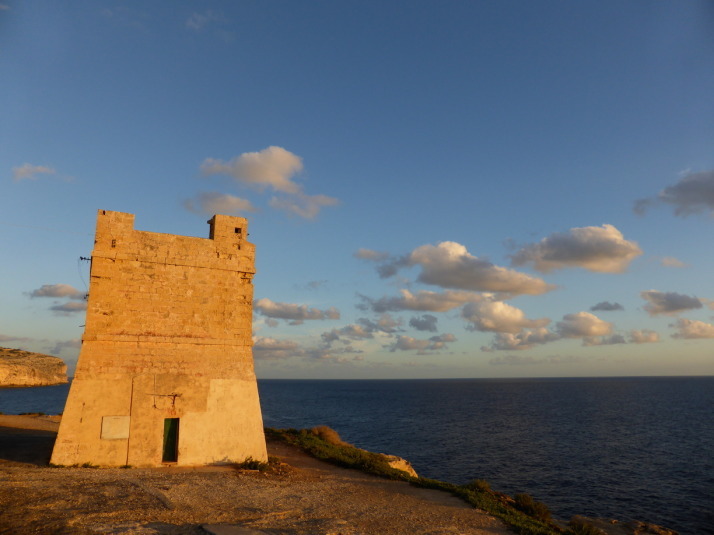 Sitting in the Mediterranean Sea closer to Sicily in the North than Libya and Tunisia to the south, Malta has had a surprisingly long and eventful history for such a tiny landmass of only 315km2 (112 square miles). Despite its small size, or perhaps because of it, Malta is the 3rd most densely populated country or sovereign state in Europe (after Monaco and Gibraltar) and 8th most in the world – though it magically maintains a desolate, isolated feel as we found out on our first stroll along a section of its south-western coastline. 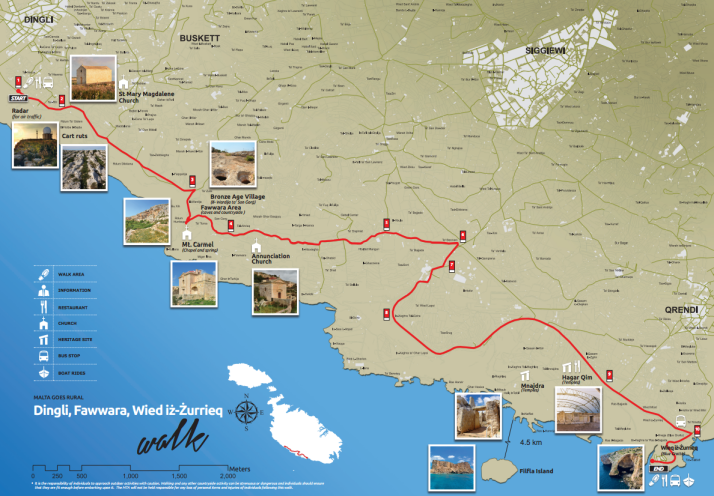 Looking at the map we thought we were in for a long stroll, until we remembered that the entire coastline of Malta is only 196.8km (122 miles) which means this walk is an easy 11.2km, or about 7 miles. 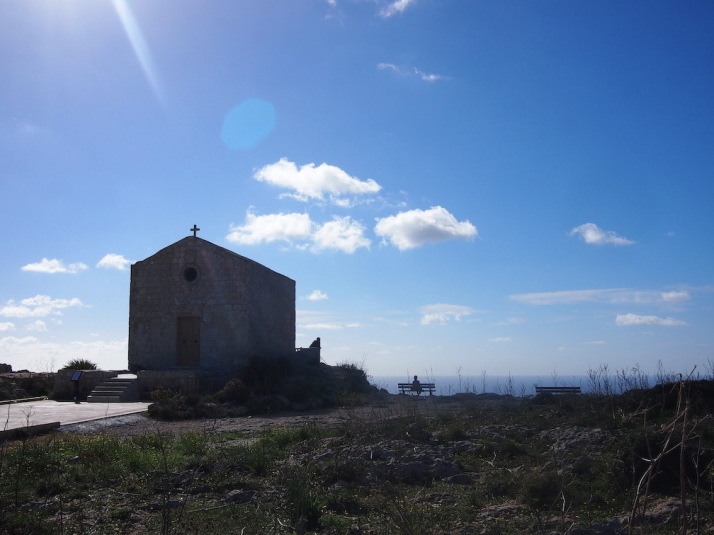 Just past a couple of radar stations at the highest point of the island, we arrived at St Mary Magdalene Church, an isolated, simple place of worship teetering on the cliff edge. Described as ‘Cart Ruts’, these man-made grooves in the garigue weren’t actually created by carts – the truth is no-one knows how or why they were made! From the roadside path it looked like a sheer drop into the Mediterranean from the rocky edge, but when we ventured closer we found that while there was a drop that would probably sting a little bit, there’s a second terraced plateau with yet another sizeable drop-off before the sea. Most of this was given over to agriculture, with the odd house or church between the fields. 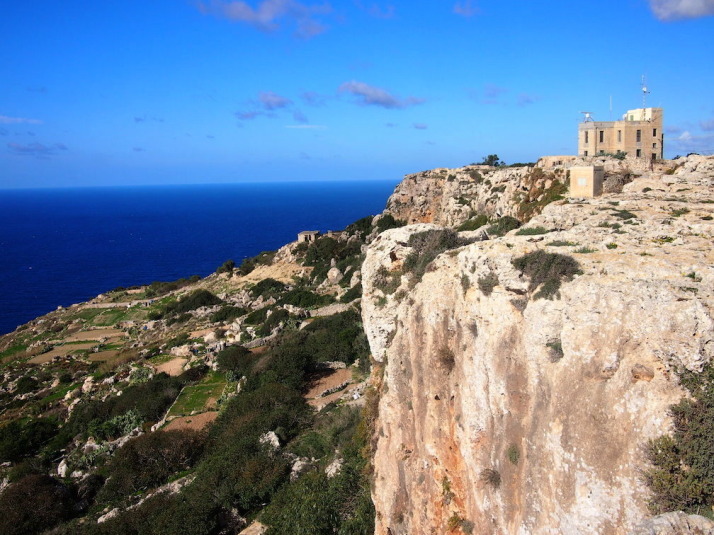 According to the map, there’s an old Bronze Age village site at Fawwara but all that we could discern from the remains was its natural vantage point that extends out from the cliffs almost to the sea, commanding amazing views up and down the coastline. From here we descended to the lower plateau and continued south to within a kilometre or two of the end where we stopped at Ħaġar Qim and Mnajdra – 2 prehistoric temple sites and outdoor museum..
Before we explored the remains of the temples, we wandered through the small but excellent museum, which, given how little is known about the origins of these temples and the peoples that built them, is mostly given over to how we think they were built, how they were rediscovered, and how they’re being preserved. 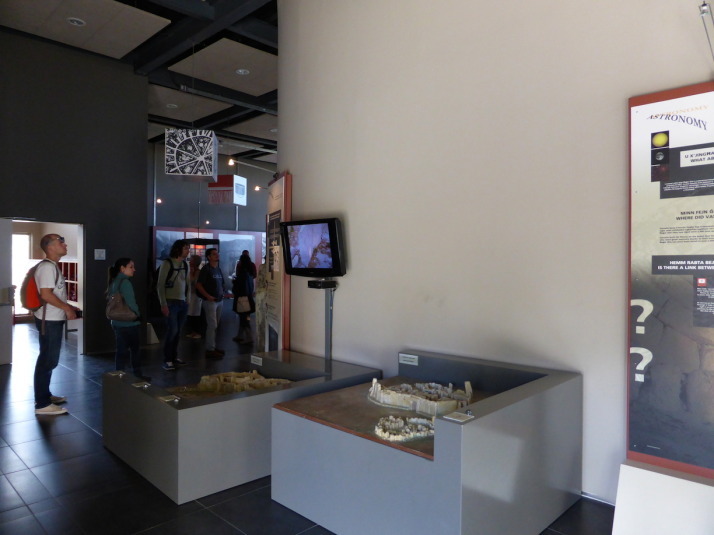 The museum includes a 10 minute “4D” introduction video experience – the 4th dimension being blasts of cold air and scented water droplets – alongside the 3D visuals that imagine the construction through to the present day ruins. It was well done and the visuals were good as they show the temples against the landscape, which isn’t possible to see anymore because there’s now a giant protective tent over each temple shielding the stone from the elements. 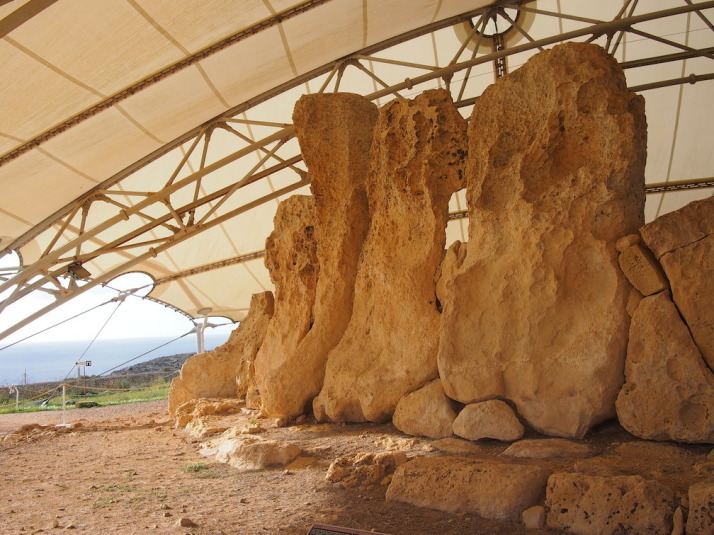 Ħaġar Qim is the first of two temple sites and is the more impressive for its relative completeness – it’s more compact and the walls are still standing tall. We enjoyed wandering through the ruins, though some sections are roped off we were still surprised how accessible they were. The audioguide was only €2 more and is good for pointing out the most interesting aspects of the construction, but almost every clip ends with a “what do you think this was for?” or “why do you think this is here?” which left us with more questions than answers! 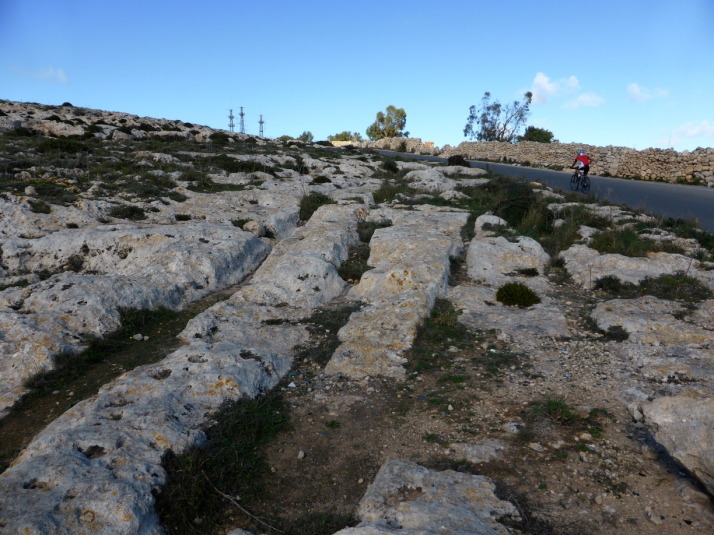 500 metres down the hillside and closer to the cliffs is the 2nd megalithic temple site of Mnajdra, a much larger set of ruins and in a worse state of repair than Ħaġar Qim. 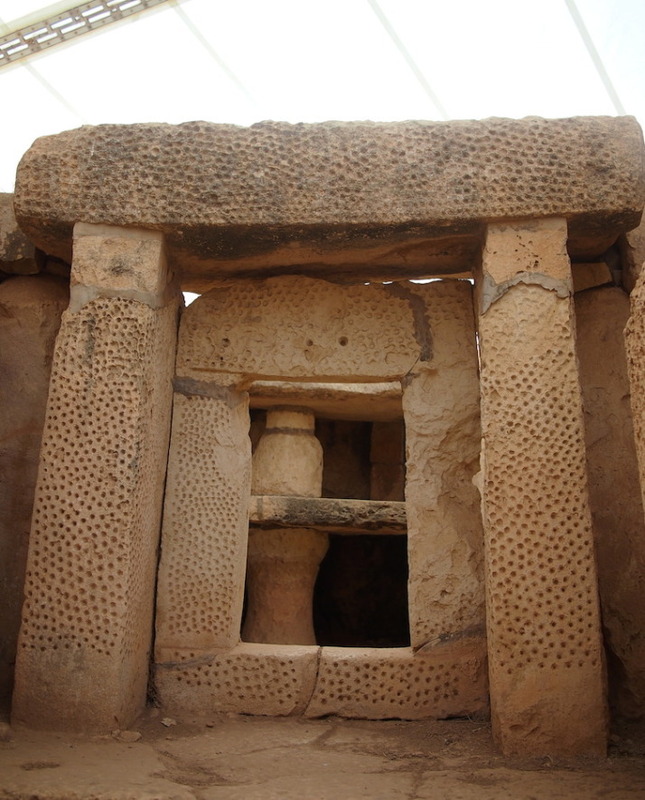 Mnajdra is actually a complex of 3 buildings..
“The first and oldest structure is the small three-apsed temple (on the right), built in the Ġgantija Phase, around 3,600-3,200BC. 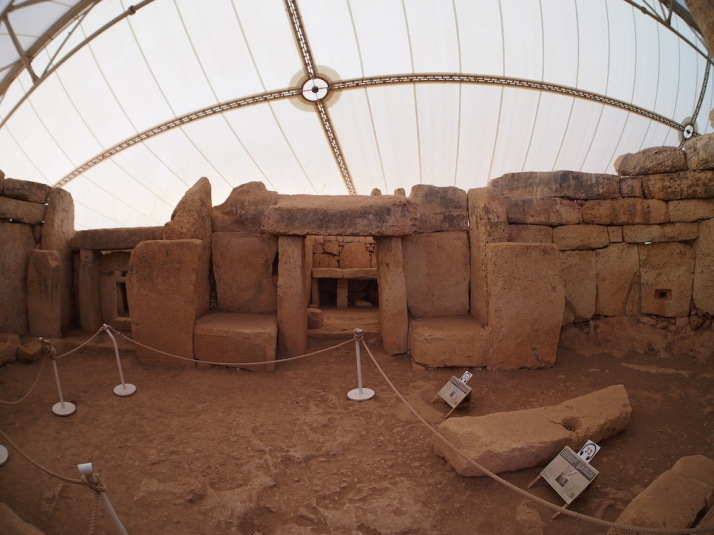 The South Temple (on the left), with its concave facade was next to be completed early in the Tarxien Phase, shortly after 3,000BC, followed by the Central Temple which was built on an artificial platform between the two earlier buildings. 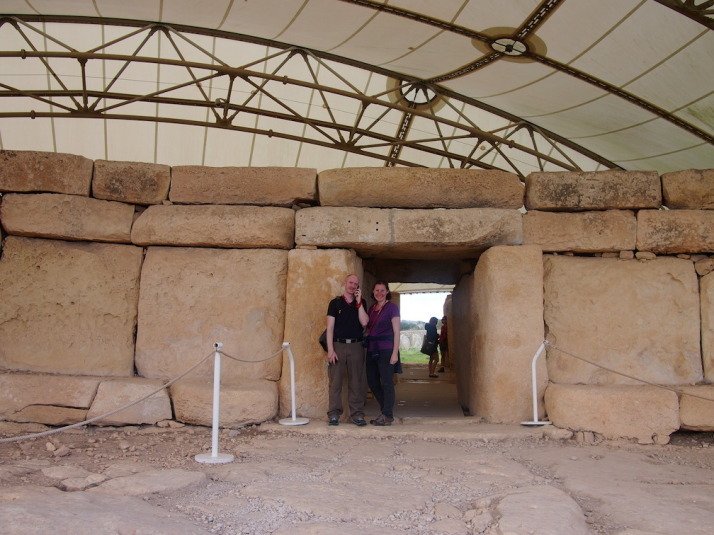 Inside the first chamber of Mnajdra’s South Temple – during the equinoxes and solstices the sunrise hits the blocks either side of this doorway, again reminding us of Stonehenge. Wow! We liked the different levels and scale of these three very different temples which at first glance just looked like one giant building. The middle temple has the most dramatic example of erosion we’ve seen – the north side of the room shows some damage but the south side is almost completely eroded. I’d have thought they’d have been equally damaged because they’d have received equal rainfall, but the museum explained that it’s the sun that does the most damage! From the museum there was a final downhill stretch to the tiny fishing village of Wied iż-Żurrieq (which we have no idea how to pronounce! ), where we watched the sun set while we waited for our bus back to the other side of the island. 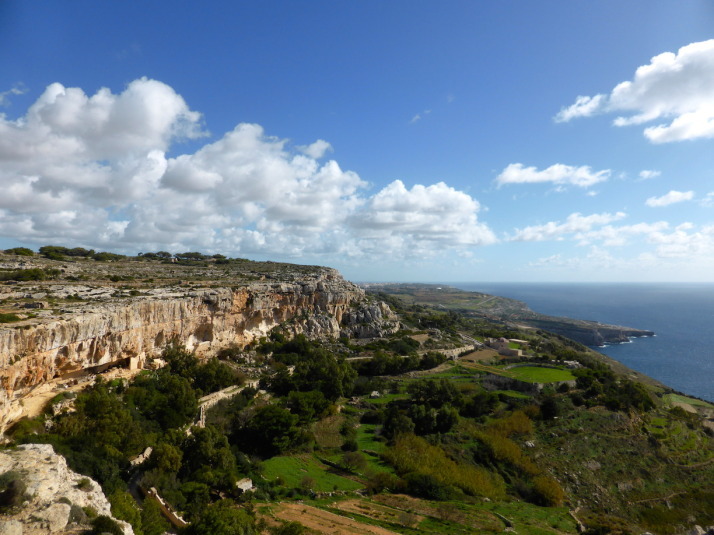 We really enjoyed the feeling of remoteness; to walk so closely to the cliff edge with the deep blue Mediterranean stretching out to the horizon on one side, and a view across the island to the Mediterranean on the other, made Malta feel really small. It’s a very easy walk too, it starts near the highest point of the island which means it’s pretty much all downhill! 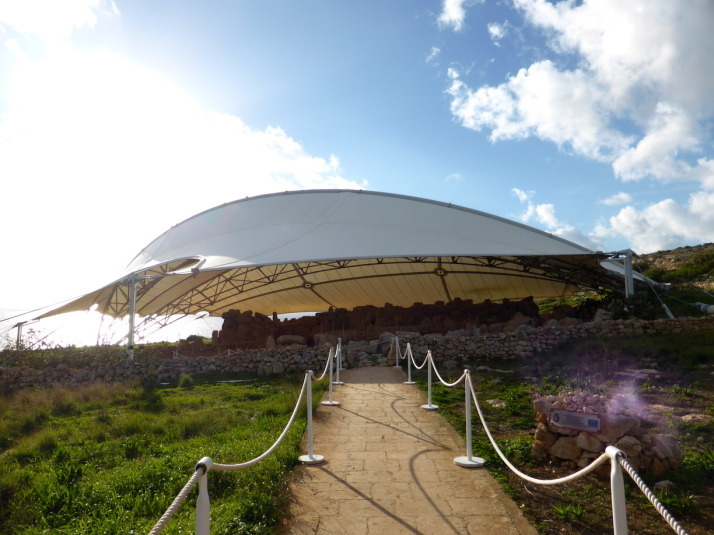 This entry was posted in Places and tagged Dingli, Malta, Museum, temple on November 26, 2014 by Andrew. Malta is great! Have you seen the mosaics in the centre of the island yet???? Have you tried the Rabbit stew??? Thanks for your questions Andreea. The buses are great for getting around Malta but I don’t think they’ll be frequent enough for you join these sights in a single day.. one option might be to rent a car or a scooter, there isn’t a lot of traffic on the roads, except rush hour Valletta of course! Otherwise a tour company or your accommodation might be able to arrange a driver for you for the day. Best of luck! What is 31 + 6 ?